Even though the petroleum and biodiesel industries rarely see eye to eye on energy policy, the two factions find common ground in a new threat to all liquid fuels—electric vehicles. An ad hoc partnership may have just formed in Fort Worth, Texas. Several automakers’ new 2018 diesel models, including Ford's first diesel F-150 truck, are being featured in late January in Fort Worth as the U.S. biodiesel industry celebrates its 25th anniversary at the 2018 National Biodiesel Conference & Expo. Canadian biodiesel producer Innoltek Inc., based in Thetford Mines, Quebec, where it operates a 5 MMly biodiesel facility, has acquired the 19 MMly Evoleum biodiesel plant formerly known as QFI Biodiesel in St-Jean-sur-Richelieu, Quebec. The report, published by a collaboration between Argonne National Laboratory, Purdue University and USDA, represents the most comprehensive lifecycle analysis of biodiesel ever produced, and it confirms biodiesel's GHG emissions reduction benefits. Evonik and Siemens are planning to use electricity from renewable sources and bacteria to convert CO2 into specialty chemicals. The two companies are working on electrolysis and fermentation processes in a joint research project called Rheticus. The historic cold snap that gripped New England and the Mid-Atlantic to kick off the New Year challenged fuel handlers throughout the region, causing sporadic operational issues for diesel fuel, heating oil professionals and their customers. 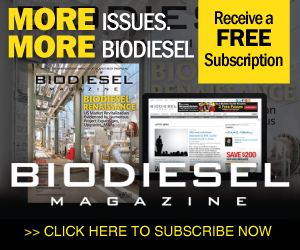 As a U.S. government shutdown looms unless lawmakers can agree on a budget before midnight Jan. 19, biodiesel companies are pressing Congress to pass the $1 per gallon biodiesel tax credit, which expired more than a year ago for the fifth time. The EU Parliament plenary vote Jan. 17 on the post-2020 EU Renewable Energy Directive rebalanced an initially negative Environment Committee report. Parliament decided not to reopen the indirect land use change debate, which was settled in 2015. The Iowa 80 Truckstop in Walcott, Iowa, has been awarded the 2018 Biodiesel Marketing Award by Bill Northey, the state's agriculture secretary. Iowa 80 Truckstop began offering biodiesel in 2002. Today it offers blends from B11 to B20 year-round. Illinois continues to top the nation in soybean production, a title it has claimed four of the past five seasons. If Illinois were a country, it would be the fourth largest soybean-producing country in the world after the U.S., Brazil and Argentina. This year’s conference, Jan. 22-25 in Fort Worth, Texas, will be a special celebration as the National Biodiesel Board is honored for 25 years of service providing research and representation for the industry in Washington, D.C., and across the U.S. The theme of the seventh annual conference—Evolve—denotes the changes being encountered by California's advanced biofuels industry. State agency staff and key experts will detail the range of important compliance changes under various regulations.